Ivan Moody and the guys from 5 Finger Death Punch have a sound that is two parts testosterone driven rock with one part aggression. The band burst on the scene in 2007 with their debut The Way of the Fist. Ivan’s distinctive vocals and the band’s take no prisoners approach to their live show quickly established them a solid following in the world of metal. Their second album, War is the Answer, was released in 2009 propelled the band to a whole new level. This album saw the band fine tuning their sound and the results were heard all over the radio. The album was deep in singles, six to be exact, with their cover of Bad Company’s song “Bad Company” exposing the band to a whole new audience. 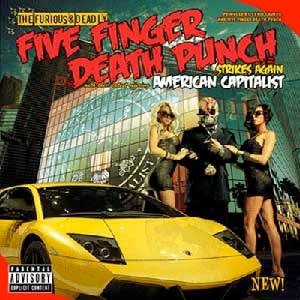 That brings us to one of 2011’s most anticipated releases: American Capitalist. Producer Kevin Churko was called in to produce again and the results are nothing short of amazing. 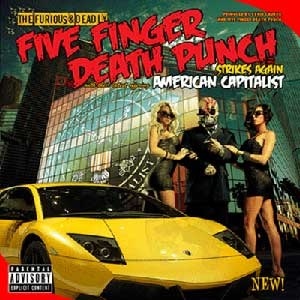 The album opens with the title track and quickly lets you know that the 5FDP sound is alive and well. The twin guitar arsenal of Zoltan Bathory and Jason Hook quickly begin to lay down the solos that are inspiring a whole new generation of guitar hero wannabes. “Under and Over It” is the first single released and it blew up big everywhere upon its release back in July. Ivan’s signature growls mixed with clean vocals on the chorus are heard loud and clear on this track. It’s definitely a very catchy track and a great choice as a leadoff single for all outlets. Track three is one that has been met with a great deal of opposition from fans and critics alike. The song is called “The Pride” and it’s been butchered for its “cheesy” or “fluffy” lyrics, which to many make no sense. Basically, it’s three minutes of Ivan naming off numerous staples from our pop culture. He then states “I’m not selling out, I’m buying it! Only the strong survive, I will not be forgotten.” Lyrics are always open to interpretation, but I think it’s all tongue in cheek and Ivan’s drive to be part of those iconic nuggets of pop culture. 5FDP also explore their softer side that was unleashed on their last album. “Coming Down” is a great example of the band being willing to show that side of themselves without coming across as wimpy. Ivan’s clean vocals combined with some very dark lyrics make this a powerful song. The other entry would be one of the best songs on the album entitled “I Remember Everything”. This song is today’s version of the big power ballad from the 80s, complete with the big guitar solo in the middle. It’s a song which serves as a letter home to Ivan’s family telling them that he’s sorry for all of his shortcomings. It’s a very powerful and emotional song with a great chorus made for being included in their live show. This song will blow up big when released as a single; mark my words. To compliment the softer side of the band, there are plenty of heavy tracks too. “Menace” and “Wicked Ways” are standout tracks for those craving the harder side of the band. Ivan’s vocals are dead on and there is plenty of shredding on both tracks. Let me add that Jeremy Spencer is a juggernaut on the drums and takes that double kick to a whole new level. The man is insane! It’s really hard to say that an album is perfect, but this one is pretty darn close. “The Pride” is a take it or leave it track for most, but other than that, this album is solid all the way through. Ivan’s vocals are stronger and even more distinct than ever. The rhythm section of Spencer on drums and new addition Chris Kael on bass have already formed a solid foundation for the band to play off of. I have already praised the one/two assault of Hook and Bathory on guitar. I think this album will propel the band to that next level, but time will have to tell. The initial week’s sales were a strong indicator as it debuted at number 3 on the Billboard Top 200. In today’s turbulent music industry, it’s not a sprint, but a marathon, so we will have to wait and see.